“You are never too young to start saving, How much is enough to retire on? Only 6% of South Africans save enough for retirement, Spending less is not saving, There is no excuse for not saving”. Yes we’ve all heard it, we’ve seen it all in newspapers, magazines and even on TV (ad nauseam). You and your savings seem to attract a whole lot of attention. Ever wondered exactly why? At face value, all these commonly heard statements appear to have merit. Figure 1 shows the indexed performance of the Dow Jones from 30 June 1916 to present – quite a bit of data there. 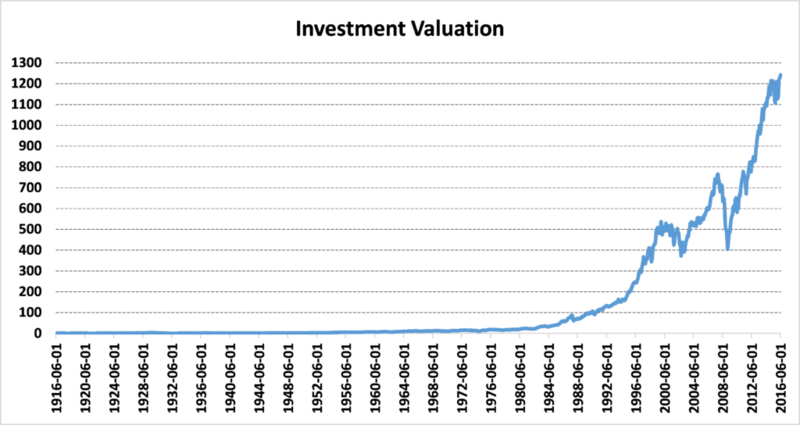 This highlights if you had invested 1 unit of capital 100 years ago and reinvested all dividends, it would be worth 1242.72 units of capital today. Saving appears to pay off rather well. That’s 1242 times your original money, so the argument goes that if you had decided to spend that 1 unit of capital 100 years ago you would forgo 1242 units of capital today – sounds like a “no-brainer”, forgo your current one unit of capital consumption to be able to consume 1242 units of capital in the future. It’s not exactly “saving nuts for the winter”, it would appear that those nuts that you buried a few summers ago, sprouted, grew into trees, created more nuts which fell off the trees, spouted, grew into trees and so forth. The nuts would have multiplied to such an extent that you wouldn’t know what to do with them all. How many nuts are you able to actually consume? Saving seems such an easy game – definitely a “no-brainer”. I would bet that everyone is thinking 3 things out there firstly “I’m not going to be around in 100 years, so who cares?”, secondly the more astute reader would suggest “Those are nominal returns and needs to be adjusted for inflationary effects“, and thirdly “That’s offshore data, what about our local market?” The first comment we will deal with a little later whilst the second comment is akin to saying “But those nuts you have now are much, much smaller than the original ones so you need to adjust for the total mass of your nut stash, and measure your nuts as per the original size”. The new nuts are “nominal” nuts rather than “real” nuts. Without getting into debate about the appropriateness of weightings and content of specific inflation indices, the US Consumer Price Index is a decent enough proxy for generalised US inflation – especially over the long run. The US CPI level has increased from 10.8 at the end of June 1916 to its current 241.038 (source Bloomberg), essentially meaning that the buying power of 1 unit has diluted by 22.32 times. So the new 1242.72 nuts are only 55.68 nuts in the original size terms. “Still not a bad outcome” I hear everyone saying. With the money that you would have spent on that luxury car 100 years ago can now buy you almost 56 cars! Sounds like a worthwhile exercise in frugality. Or does it? Well unfortunately there’s the ultimate “Elephant in the room” that needs to be taken into consideration: Investment Fees or Total Expense Ratios (TER’s). Fees are charged on nominal value and South African Equity General fund fees range from 0.17% to 5.34% per annum (source: Glacier). This excludes any auxiliary fees which may be added to this number. 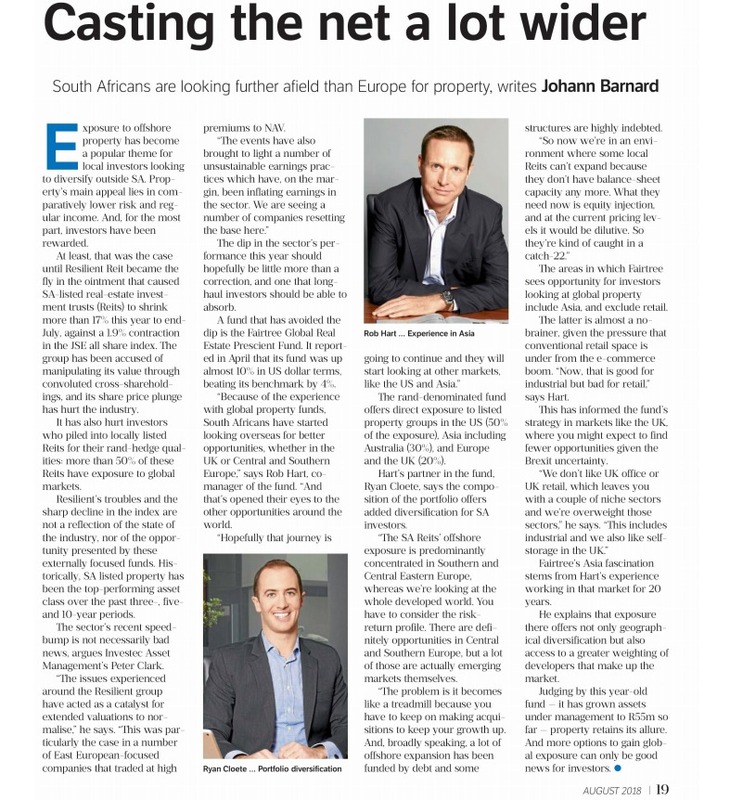 So let’s say that you, the investor, were charged 2% total fee per annum, how much would your final investment be worth. How many nuts would you have? Well unfortunately for the investor, thanks to those fees, the nominal 1242.7 nuts are reduced to nominal 171.5 nuts. In real terms your 55.7 real nuts have reduced to 7.7 nuts. So where have all the nuts gone? Well they haven’t disappeared, that luxury car that you didn’t buy 100 years ago can now buy you 7.7 luxury cars today. But that exercise in frugality has also bought 48 luxury cars for the investment industry. Of course the first point is valid, one does not live for 100 years but if we consider an “average person” who joins the formal workforce at 20 and retires at 65 the effects of fees are still huge. 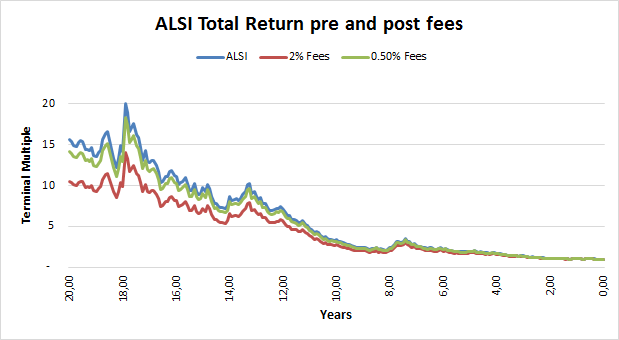 In fact we can model the effects of fees quite simply in terms of tenor of the underlying investment. Figure 2 shows the effects of compounding fees at 2% over different investment horizon periods. These Terminal Value Factors (TVF) can be multiplied by the terminal value of any non-fee paying index to compute the actual realised investment. If one would like to compute what the non-fee paying value of your investment is, you can just divide the realised value by the appropriate terminal value factor. If investing is “For the long term” then the effect of fees certainly do erode the nominal and therefore real returns that one can experience. Perhaps a more transparent approach would be to disclose the power of compounding fees by showing investors the nominal effect. I think it would be a rather difficult fee discussion if an investment manager were to disclose that fees for 45 years at 2% would erode some 59% of the terminal value of the investment – irrespective of where that terminal value ends. So for the investor that is planning to squirrel away cash for 45 years his total fee could be charged in 3 different ways resulting in exactly the same outcome at the end of that 45 year investment period. Just the extent of those second 2 options makes them completely unpalatable, but unfortunately over the long term 2% per annum compounding fee results in the investor paying exactly the same. So what realistically can be achieved with lower TERs? Figure 3 compares the effects of lower 0.50% per annum TER on Terminal Value Factors over the longer run, bringing to the forefront that the fee discussion probably does need deeper inspection. The comparative leaves one rather weak at the knees. We do begin to understand the drive industrywide to cut costs and therefore lower fees. Looking at the local equity market returns yields similar results. Figure 4 shows the multiple of your original investment in the South African All Share Index (source ABSA Capital) for given time periods. 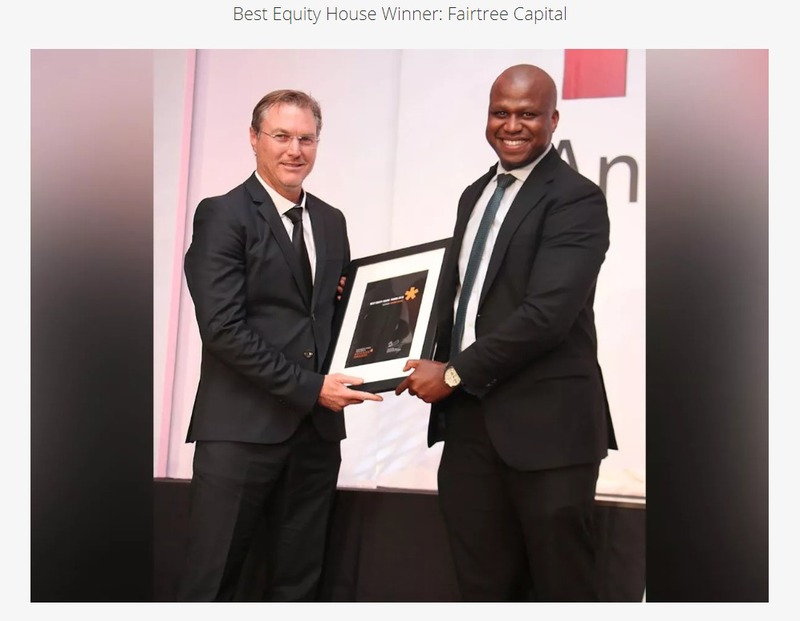 Over the past 20 years you would have multiplied your original investment by over 15 times, unfortunately for the 2% fee paying investor the result would have been just over 10 times. So investment managers actually do care about you and your savings, they want you to save much more and invest for a very long time. In fact there is no excuse not to start saving early – that is a perfectly rational thing for someone from the investment management industry to suggest. Perhaps the real problem with individuals retiring with too few nuts saved is due to excessive ongoing fees rather than original invested amounts. One can presume the corollary that managers that produce consistent alpha over the long run could “significantly change that outcome” but unfortunately this appears a fool’s errand since we lack enough data to infer anything that is statistically significant (it’s that word again). Unfortunately there isn’t any manager with a long enough historical track record to infer anything about his/her alpha producing probabilities over the medium term, let alone the long term. And if your filtered sample of investment managers running the same mandate over the long term (read 20+ years) was 3, would it be prudent to only consider those investment managers? I think not. I think we should be looking at fees from a different perspective, perhaps we should be minimising rent seeking fixed fees whilst re-opening discussions on performance based fees where alpha producing managers are rewarded for risk adjusted alpha production. I would think that the overall number of investment managers would reduce as rent seeking is squeezed out. Can you imagine paying fees for risk adjusted alpha production only? Perhaps then we might finally go down the road of looser mandates that allow the manager the scope to seek out those elusive alpha strategies in one asset class then transport them onto another selected index or risk tolerance. So next time you hear “Fees must Fall” or that our industry requires simpler products with lower fees, think about it really hard about what it means before actually responding.